Whatever the weather, Paddyfest is here to party! It seems that Brisbane is in for a wee bit of rain this weekend, and here at Paddyfest we think this adds to a truly Irish experience! With the luck of the Irish we’ll see the sun shining tomorrow, but the weather in Ireland is unreliable at the best of times so there’s one thing that we can be sure of – the Irish love of partying. And party is what we’ll do! We’ve relocated some of the fun so everything is undercover to ensure everyone stays dry – as planned, the bars are stocked high with Guinness, the food trucks are serving up hot Irish dishes and Kingswood & the Irish entertainment will still go ahead! So rally your friends, and enjoy a truly Irish experience at Brisbane’s biggest St Patrick’s Day party. Purchasing tickets to Paddyfest can only be done online by clicking here or at the gate on the day. If you have bought tickets to the Festival through any other channels, we cannot guarantee that you will be able to enter the Festival with those tickets. General Admission e-Tickets will be emailed (with a link for you to download) to the email address you provided during the booking process once your credit card has been successfully charged. If you do not receive your e-Ticket(s) please contact us by writing an email to sales@brc.com.au. VIP tickets will be posted 7-10 days prior to the event. When you buy a ticket at the gate on the day, you will receive it there. I haven’t received my tickets – help! Don’t panic! Normally the ticket will arrive within a few minutes of your card being successfully charged. If it doesn’t arrive, we can help you, just drop us a line to sales@brc.com.au with your full name, mobile phone number and the email address you used to buy your e-Ticket. What if I don’t have a printer! Too easy, just show us your e-Ticket on your smart phone or device, we can scan the barcode from there. I’ve bought multiple tickets for me and my mates, but we’re arriving separately. What do I do? The e-Ticket attached to the email you received after making your booking will contain one page for every ticket in your order. The easiest way is to print them and give them out amongst your group. Be very careful not to mix them up as each e-Ticket can only be scanned once to get entry into the Festival! 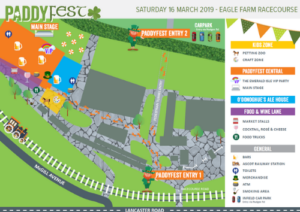 Paddyfest is on Saturday 16 March 2019. Paddyfest is held at Eagle Farm Racecourse, at the northern end of Racecourse Road in the suburb of Ascot, 7 kilometres from the Brisbane CBD. How do I get to Paddyfest? There are plenty of taxi, ride share and car parking options – click here for more information. Paddyfest will open at 12 midday and run until late! Will there be horses racing at Paddyfest? No, there will be no horse racing at Paddyfest. All things green, Irish and St Patrick’s Day inspired! Think shamrocks, green top hats and leprechaun beards! And be sure to enter our Best Dressed competition on the day! All tables at Paddyfest are on a first come first served basis. While there will be plenty of room for everyone, we are unable to reserve tables. Arrive early on the day to secure your spot! The Emerald Isle VIP Party has lots of seating and great views! If seating is a priority for your group, we would recommend booking in to this package. Of course! We have so much going on for kids this year with an entire Zone dedicated to them! Children can attend Paddyfest in the General Admission areas only. Children must be accompanied by a parent or guardian, and must be registered at the Main Gates and required to wear an Under 18 wristband for identification. Child tickets cannot be pre-purchased and must be arranged on the day. You sure can! Remember to scan your ticket “out” on leaving the Festival and keep your ticket on you – then come and go as you please. Why are bag checks necessary and what things can and can’t I bring into the Festival site? Bag checks are necessary because some things are not allowed to be brought to Paddyfest. Examples of some things you can’t bring in are: food, alcohol, glass, weapons, illicit substances or pets. It is a condition of entry to the Festival that you permit a search of your possessions at the time of entry to the venue. Any item we may consider inappropriate can’t be brought in and may be confiscated. Refusal to consent to a search will prevent your entry to the Festival site. Unfortunately pets are not permitted on the Paddyfest site, unless they are registered assistance animals, in which case they are welcome. Smoking is permitted in designated smoking areas only. Alcohol is not permitted to be taken into designated smoking areas. Is this an air-conditioned or open air venue? Paddyfest has several air-conditioned inside bars available for access throughout the day.